In calculus, an integral is the space under a graph of an equation (sometimes said as "the area under a curve"). An integral is the reverse of a derivative. 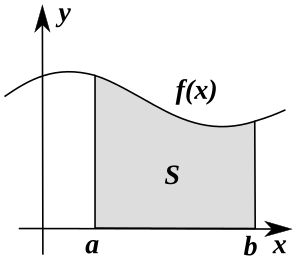 A derivative is the steepness (or "slope"), as the rate of change, of a curve. The word "integral" can also be used as an adjective meaning "related to integers". The symbol for integration, in calculus, is: as a tall letter "S". This symbol was first used by Gottfried Wilhelm Leibniz, who used it as a stylized "ſ" (for summa, Latin for sum) to mean the summation of the area covered by an equation, such as y = f(x). Integrals and derivatives are part of a branch of mathematics called calculus. The link between these two is very important, and is called the Fundamental Theorem of Calculus. The theorem says that an integral can be reversed by a derivative, similar to how an addition can be reversed by a subtraction. Integration helps when trying to multiply units into a problem. For example, if a problem with rate, , needs an answer with just distance, one solution is to integrate with respect to time. This means multiplying in time to cancel the time in . This is done by adding small slices of the rate graph together. The slices are close to zero in width, but adding them forever makes them add up to a whole. This is called a Riemann Sum. Adding these slices together gives the equation that the first equation is the derivative of. Integrals are like a way to add many tiny things together by hand. It is like summation, which is adding . The difference with integration is that we also have to add all the decimals and fractions in between. Another time integration is helpful is when finding the volume of a solid. It can add two-dimensional (without width) slices of the solid together forever until there is a width. This means the object now has three dimensions: the original two and a width. This gives the volume of the three-dimensional object described. By the fundamental theorem of calculus, the integral is the antiderivative. The at the end is what shows that we are integrating with respect to x, that is, as x changes. This can be seen to be the inverse of differentiation. However, there is a constant, C, added when you integrate. This is called the constant of integration. This is required because differentiating an integer results in zero, therefore integrating zero (which can be put onto the end of any integrand) produces an integer, C. The value of this integer would be found by using given conditions. The two vertical bars indicated a absolute value; the sign (positive or negative) of is ignored. This is because there is no value for the natural logarithm of negative numbers. Note that both integrals have the same limits. This can only be done with a constant. Proof is again by the definition of an integral. Double integral as volume under a surface. A line integral sums together elements along a curve. Integral Facts for Kids. Kiddle Encyclopedia.